All SW-foodgloves supplied by Seeway Gloves to the food-processing industry, meets CE and SGS food guidelines. 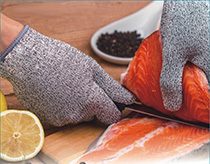 FoodFlex series, the meat cut resistant gloves can reach anti-cut level 5. And it is anti-bacteria which is very important for the food industry especially, for meat. 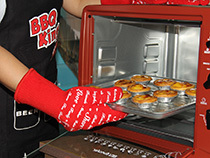 Excellent resistance to shrinkage contributes to FoodFlex gloves' long service life. It is reusable for approximately 40 times after several washes.